That is one gray day looking at us today, with clouds overhead and the people in the know calling for rain but the subdued skies can't put too much of a damper on us since we have a super afternoon to look forward to, a photo shoot featuring summertime cocktails for an upcoming article we are writing for the local paper. 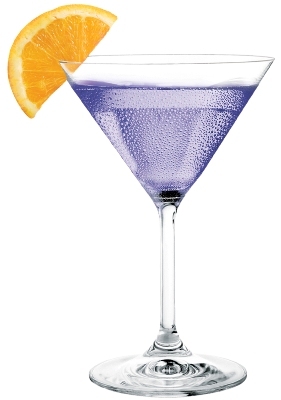 We love to immerse ourselves in 'cocktail research' (can you think of anything more fun) and during our vast search we came across this violet delight that we couldn't help sharing with you! Seems almost perfect for a day like today, softly hued with just a pinch of excitement lurking at the edges, fits our mood like a glove! Shake in a cocktail shaker filled with ice. Strain into a perfectly chilled martini glass. Garnish with a orange slice. Come visit with us on Facebook, Twitter and Pinterest! Cocktail research? That may possibly be the very best job ever!!! This sounds YUM!!! and I'm so happy that the weather people were off on the rain - I had to make my way into the city and was dreading the traffic in rain.